In June, 2016 I attended an Enneagram workshop in London taught by two of the leading Enneagram teachers in the world, Russ Hudson (teaching) and Robert Holden (seated). In this entry I summarize a recent teaching session done by Robert on how the the Enneagram can be used as a tool to develop greater self-love. Last fall as we were reading Simon’s confrontation with the Lord of the Flies in William Golding’s famous novel by that name, we discussed how the beast strategically attacks Simon at the level of self-doubt and personal insecurity. I paused, then, and asked my students: how many of you are tougher on yourselves than anyone else is in your life? Immediately 85% of the hands went up. That was a watershed moment for me, for I realized that perhaps the biggest problem most HKIS students face is what is called the Inner Critic, which can become a corrosive force upon one’s being. So, the big question is what can be done about an overly aggressive Inner Critic. My tool of choice has been the Loving Kindness Meditation, which a good number of research studies and my own teaching experience suggest is frequently effective. What I would like to do here, however, is introduce greater creativity beyond the LKM in developing self-love practices based on the 9 Points of the Enneagram. Enneagram teacher Robert Holden, whom I got to hear for a week in London in 2016, gave a brilliant talk at the 2018 Enneagram Global Summit on “Self-Love and the Enneagram.” This entry summarizes the teachings and practices he shared. Robert explains that studying the Enneagram is in itself an exercise in self-love because you are giving compassionate attention to the self in all its glory, illusions, and limitations. The great gift of the Enneagram is that it can be used as a lens through which to explore 9 different perspectives on many topics, such as love. My hope is you will find some new insight into how to love yourself more authentically through his teachings. Teaching: Most of our thinking in our lives is judging – situations, other people, and of course ourselves, which oftentimes interferes with a loving perspective. The challenge to the 1, and the 1 in all of us, is to heed Jesus’ advice, “Judge not, that you be not judged.” How do we suspend the constant voice of judgment of all things, which includes ourselves? Practice: Consider what’s it like to be yourself when you are not judging yourself. Say the prayer below to yourself, and then sit and observe yourself in this spirit. Repeat this process for some specified length of time. For you are lovable and you are made of love. It is easier to love others than to love yourself. The more you love yourself, the more you love others. The vast majority of people agree with both statements, but this proposes something of a contradiction for most of us experientially. The crux of the issue is that somehow we feel that self-love is selfish, and that if we love ourselves, we will have less love for others. Yet the heart knows the truth in practice: the more you love yourself, the more you love others. The true nature of your heart is love – and the following practices ask you to tune into this Larger Self of love. Practice: Ask your ego to relax and allow your heart, your true nature, to self-love for you. Practically, then, ask your heart this question: “How can I let my heart love me today?” Then sit in silence, letting the question abide with you. Repeat this process. Teaching: Most of us work really hard to create a lovable self-image, and our fear is that we are not loved for ourselves. Deep down we all believe that love, including self-love, has to be earned. But what if the heart is already lovable? Consider a new born baby. They have achieved nothing, yet they are irresistibly lovable. Your essence is love, but in order to experience that as your default setting requires a transformed mindset. Practice: Ask your heart how it can show up in every aspect of your life. Walk through your day and ask your heart to manifest itself in your physical, mental, and emotional life situations – in every conversation, every email, every class, every assignment. Teaching: The British band “The Who” has a line in their song “Melancholia” that goes like this, “The sun is shining but not for me.” This is our feeling oftentimes that somewhere we are excluded from the reality of love. Yet love shines like the sun – on everyone. Jesus famously said, “God causes the sun to rise on the evil and the good, and sends rain on the righteous and unrighteous.” Galileo once wrote, “The sun with all those planets revolving around it and dependent upon it can still ripen a bunch of grapes as if it had nothing else in the universe to do.” We can bring the self we have rejected, the self we are ashamed of, and bring it into the circle of love, knowing that we will be included. We come to see that self-love is the awareness that we are really made of love and that fundamentally we are love. To live apart from love is truly to be out of touch with reality. Love, which created me, is what I am. Practice: First, call to mind the aspects of yourself that you have rejected and are embarrassed by. Imagine sitting with that self in shadows. Then bring that self into the light of the sun, basking in its power to accept, nurture, grow, and transform. Teaching: Self-love is not something we will ever get our head around. We have to practice “self-emptying,” the letting go of our ideas about self-love in order to truly know what self-love is. Rumi wrote a poem where he addresses this mind-heart relationship called “Sacrifice Your Intellect in Love for the Friend,” in which “the friend” is your true nature or even the divine itself. Rumi goes on to say, “Intellect comes from where the friend is.” If love is reality, then thought should emerge out of this central fundamental truth. Rumi continues that intellectuals often show off, while lovers allow themselves to be bewildered, a state of affairs that oftentimes makes no sense. The intellect needs to relax and let love reveal itself. Love knows how to love in a mysterious way that the intellect cannot fathom; love is a mystery that needs to be cherished more than understood. We are asked at point 5 to surrender our egoic attempts to love, and to become a student of love, learning from its ways. Practice: Read a sacred scripture or poetry about love (I Corinthians 13; Rumi’s poetry) and attempt to receive it not only mentally, but also physically and emotionally. Then enter into a time of surrender meditation (where you allow thoughts to come and go without grasping) to practice becoming a student to love. Enter into a dialogue with love, asking love to teach you about love. Practice: The practice here is to ask yourselves, “How is life loving you right now?” Then answer this question ten times. Sometimes you may have nothing that comes to you, but stay with it. Or, as at point 5, ask love to teach you how to guide you in this practice. This practice of gratitude turns your attention towards manifestations of love in your life. Then go onto the second part of the practice, which is, “How can I allow life to love me more?” Mix this question with time for reflection or quiet waiting. Teaching: Looking for a love is a painful process, and searching for a life partner is even more difficult. When we are looking for love, we will never stop or rest until we have found that which satisfies. Yet this quest is a sure sign that we have lost our way spiritually because it’s the internal sense of love that we need to find. DH Lawrence said, “Those who go searching for love only make manifest their own lovelessness. And the loveless never find love. Only the loving find love, and they never have to seek for it.” We are the love we are looking for. Teaching: The challenge at point 8 is to let go of self-reliance in order to let love in. We become self-reliant because we don’t want to get hurt again. We are afraid to allow love to touch us. However, this thing that we most want, love, only thrives in an atmosphere of vulnerability. Practically, this means forgiving those who have wounded us. We don’t know how to forgive, but if we surrender to forgiveness, allowing it teach us how, then we can give up self-reliance and come, paradoxically, to depend on something deeper. Practice: In this practice, bring a person to mind that you want to forgive, read the poem to yourself, and then attempt to simply hold that person in mind. Then return to the poem and again alternate to the person. Don’t worry if there is no warmth towards the one you have in mind. Simply do the exercise, trusting that you are engaging some deeper, less tangible process to work in your heart. The angel of forgiveness takes you with her into the innocence again. She takes you with her when you are ready to go. She is closer to you than anything outside of you or within. The angel of forgiveness, your friend. Point 9 affirms our deep need, then, to love ourselves. It’s by loving ourselves that we will be able to truly love others. In the end, every argument, every debate, every war, every hate, every resentment, every rivalry must end in love. If we can know this in our full self – in the body, mind, and heart – then we can be the presence of love for everyone in our life, including ourselves. We need to bring this love into the world. Practice: Create your own affirmation that you repeat to yourself. For instance, “Because I am holy love, I let go of judgments, accusations, and defense mechanisms that separate me from my true nature.” Alternate the statement with periods of sitting in open presence. Since 9’s are oftentimes out of touch with their bodies, you could choose one characteristic that you want to let go of (e.g., judgment) for the mind center, one for the heart, and one for the gut as you focus on each region of the body. Or you could do the same approach, repeating an affirmation and then focusing on a positive quality associated with that region of the body (e.g., loving attention in the mind; undivided emotional support for the heart; stability in the gut). Very thoughtful reflections on love and the Enneagram by a teacher that I did a workshop with in Singapore. 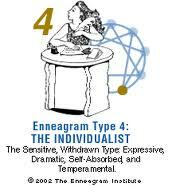 This entry was posted in inner awakening and tagged Enneagram, spiritual practice, Wisdom Tradition. Bookmark the permalink.